Exhibition: SHOCK! 1914… What if war began tomorrow? Exhibition: Unlocking Sources 1914-1918: The Making Of! 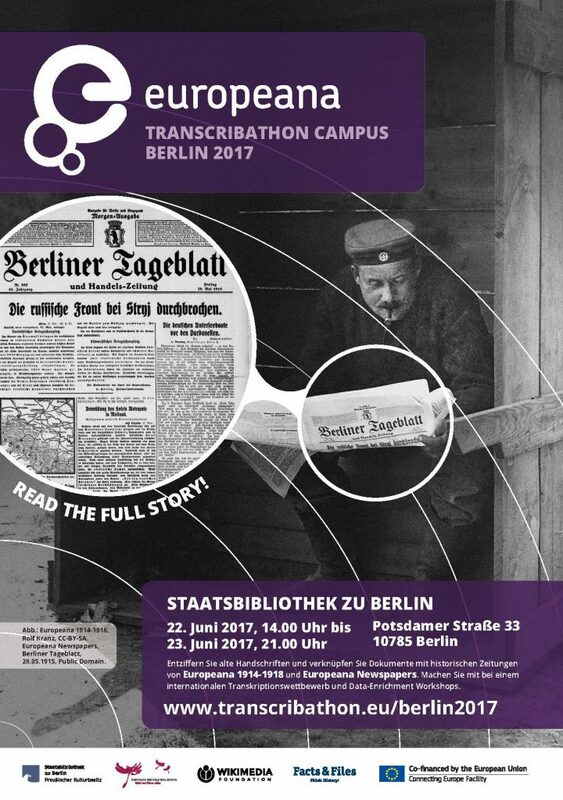 Join us from Thursday 22 June 2017 to Friday 23 June 2017 in the Europeana Transcribathon Campus Berlin 2017 at the Berlin State Library! The goal of this two-day challenge is to make documents from the First World War more accessible. We need your help to transcribe and annotate letters, diaries and newspapers from the projects Europeana 1914-1918 and Europeana Newspapers. Transcribathon challenge (German/English): Participants will be grouped into cross-generational teams who compete with each other to transcribe historical sources on www.transcribathon.eu. Starting in the afternoon of Thursday 22 June, the teams have 28 hours to transcribe as much text as they can and present their results to an international jury on the following day. Our team members will assist them during the competition. Friday 23 June. These include workstations for transcription, annotation, geo-tagging, Linked Open Data and Wikimedia/Wikisource and offer the possibility to discuss with experts. Throughout the event there will be a number of activities that participants can join, including talks, a panel discussion and a Transcribathon party! Sign-up to this exciting opportunity by 14 June 2017 and join us in the enrichment of fascinating historical sources in an international environment! Register for free via Eventbrite here and find out more about the Campus Berlin event here. Europeana Transcribathon Campus Berlin 2017 is organised by Europeana, Facts & Files and the Berlin State Library, in cooperation with the German Digital Library and Wikimedia. For questions please contact team@transcribathon.eu. Exhibition Shock! 1914 – What if war began tomorrow? The exhibition at the Royal Library of Belgium has opened on 11.09.2014 and will continue until 28.02.2015 – read the details here! The film narrates the story of Walter Flex, war volunteer right from the start of the First World War and one of the best-known writers it produced. Important documents of his literary remains, which are kept in the Staatsbibliothek zu Berlin, have now been digitised and are freely accessible in the digital culture portal ‘Europeana’. The film looks behind the scenes of the digitisation centre of the Staatsbibliothek and reveals how his letters, manuscripts, photos and personal documents, among them a map with a bullet hole, were put online by the Staatsbibliothek. The film was produced in a co-operation between the projects Europeana Collections 1914-1918 and Europeana Newspapers. The film is available also with subtitles in German, French and Italian language. In this conference to be hosted by the University of Antwerp and the British Library, World War One is discussed in terms of its influence on language: what changes were there within individual languages, and how did the languages of combatant nations influence each other? Was schoolboy French of any use to British soldiers, how did the profession of interpretation develop, how was Esperanto used, and how did soldiers use parables and poetry in letters home? The conference will examine the linguistic experience of the war through a wide range of subjects covering 10 languages used during the conflict. The next event organised by the Europeana Collections 1914-1918 project consortium is going to take place in Firenze, Italy at 16.04. 2014, 03:00 p.m. Please follow the link to the detailed programme: Europeana 1914-1918 – A CENTO ANNI DALLA PRIMA GUERRA MONDIALE: il patrimonio della memoria strica nelle raccolte digitalizzate della Biblioteca Nationale Centrale di Firenze, Biblioteca Nationale Centrale de Firenze, Firenze, Italy. On 27. March 2014 the conference “Europeana Collections 1914-1918 – The First World War in National and European collections: materials, images, testimonies” will be held at the National Central Library of Rome. Registration is open now. Please find detailed information about the conference here. On 03./04. April 2014 the conference “Europeana Collections 1914-1918 – Rediscovering the war experience” will be held at Bibliothèque nationale de France. Registration is open now. Please find detailed information about the conference here. Europeana Collections 1914-1918 from Europeana Collections on Vimeo. The Europeana Collections 1914-1918 project consortium is going to organise and host events to inform about the project and to showcase the digitised objects. The list of events has been published now – please find out more and click here! Europeana 1914-1918 - Thematic portal presenting around 400.000 digitised items from the First World War comprising the Europeana Collections 1914-1918 collections. Newsfeed - Newsfeed on the Europeana Collections 1914-1918 project website. pro.europeana.eu - Background information for and on project's related to Europeana and those who want to participate in Europeana.eu.